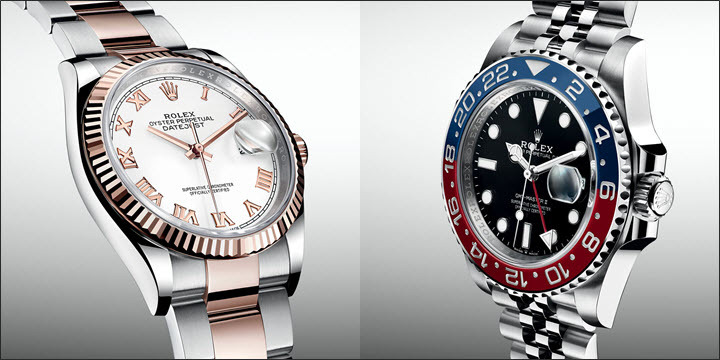 Each year, Rolex opt to unveil their latest models at the Baselworld Fair, and this year was no different. Indeed, the manufacturer recently introduced a wide variety of new timepieces, spanning across multiple different collections. Some of these models are completely new offerings, while others bring existing models up-to-date, or give them a slightly different aesthetic. 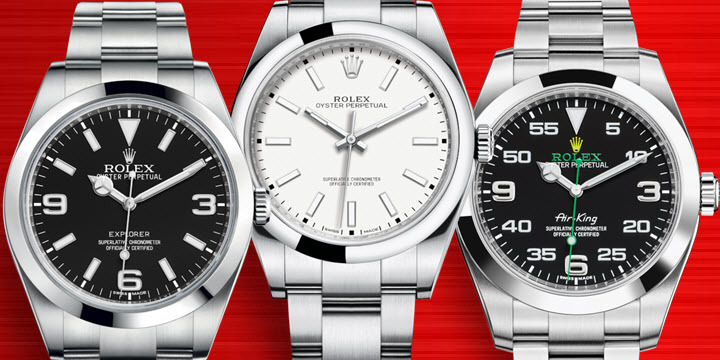 In this article, we explore the new Rolex models introduced at Baselworld 2019. Initially introduced in 1945, the Rolex Datejust 36 was the first model ever released in the manufacturer’s iconic Datejust collection and it remains one of the most popular options for buyers looking for a Rolex timepiece. However, over the years, the Datejust 36 line has been expanded and now includes a wide variety of different options, with multiple different case materials and color schemes. In this guide, we take an in-depth look at the various options that are available, so that you can make a more informed purchase and buy the best watch for you. 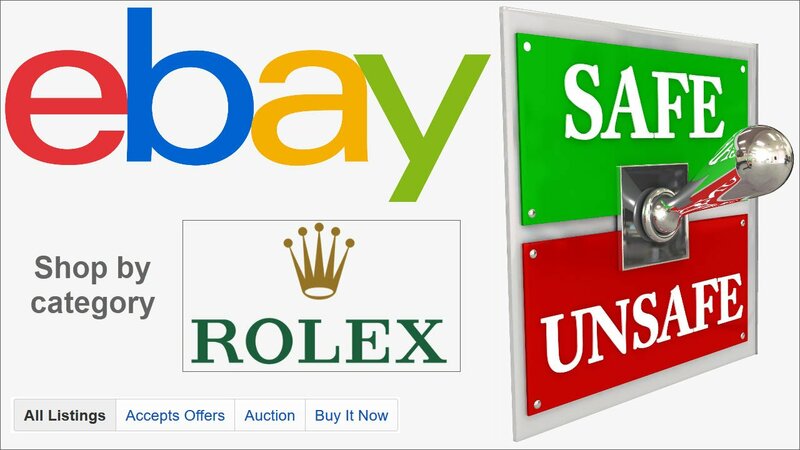 Is it Safe to Buy a Rolex on EBAY? 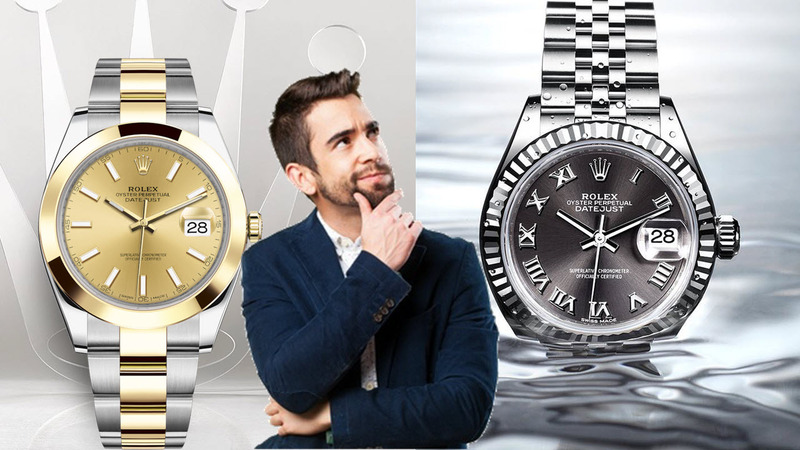 Many buyers looking to purchase a Rolex watch are drawn to online platforms like eBay, but with so many fake or counterfeit Rolex timepieces flooding the market, is it actually safe to buy one in this way? The answer is both ‘yes’ and ‘no’. You certainly can find authentic new, used and vintage Rolex watches on eBay, and if you are experienced enough to know what to look for, you might even find a good deal every now and then. 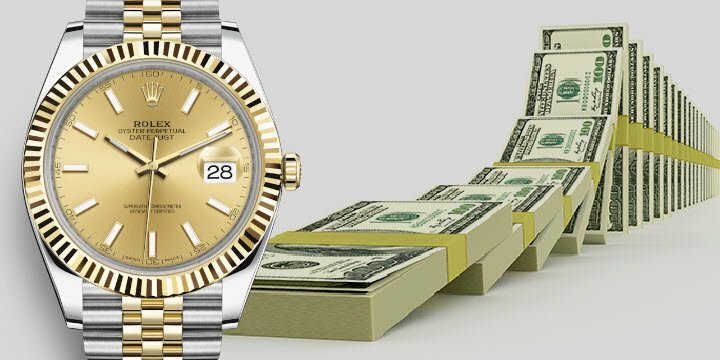 Which Rolex to Buy as an Investment? Purchasing a Rolex sounds like a fool-proof plan: buy a high-quality luxury timepiece or other piece of jewellery, which you can later convert into cash when times are tough. In the case of jewellery, you can claim the material value, so prior to making a purchase, you should determine how much you are paying for gold or diamonds, and how much you are paying for the craftsmanship, and then make your decision based on potential re-sale of the materials. 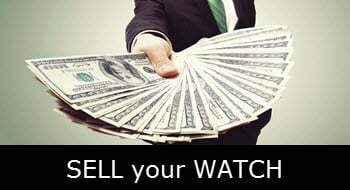 With luxury watches, on the other hand, you are going to want to sell for more than just the material value. The problem here is that watches are mechanical devices, meaning the quality of their inner-workings will be taken into account. They are also subject to changes in fashion, and value can be dictated by availability too. 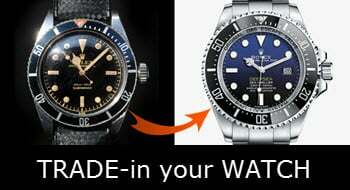 Why Buy a Used Rolex Submariner? 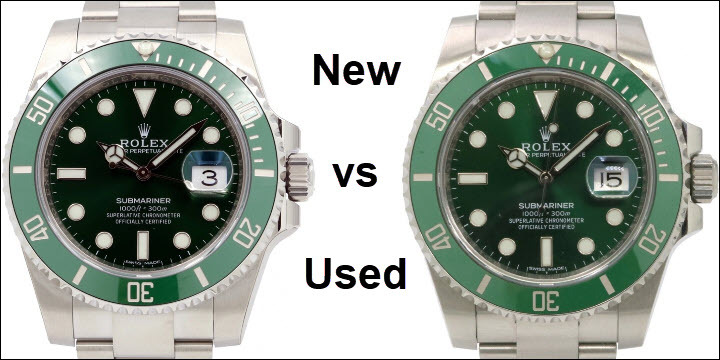 New vs Used Rolex Submariner Hulk: Only difference visible is due to the camera angle and lighting. Launched in 1953, the Rolex Submariner is one of the most iconic timepieces in the entire Rolex collection. A sports watch, designed for use by professional divers, the Submariner was also worn by Sean Connery, George Lazenby, Roger Moore and Timothy Dalton in several James Bond films, including ‘Dr. No’, ‘Goldfinger’ and ‘Live and Let Die’. If you are looking to buy a Rolex Submariner watch, your two main options are to buy a brand new model from an Authorized Dealer, or buy an authentic new or second hand model from a reputable grey market dealer like Jaztime.com. In this article, we explain why a used Submariner might be the best possible choice for you. Originally introduced in 1953, the Rolex Oyster Perpetual Submariner collection is a line of sports watches that are equally well-suited for use in a board meeting. This diversity has helped to establish the Submariner as one of the most popular wristwatches in the world, with some individual models achieving true iconic status. The Submariner was originally designed to accommodate the needs of professional divers, and this remains one of the collection’s main selling points. 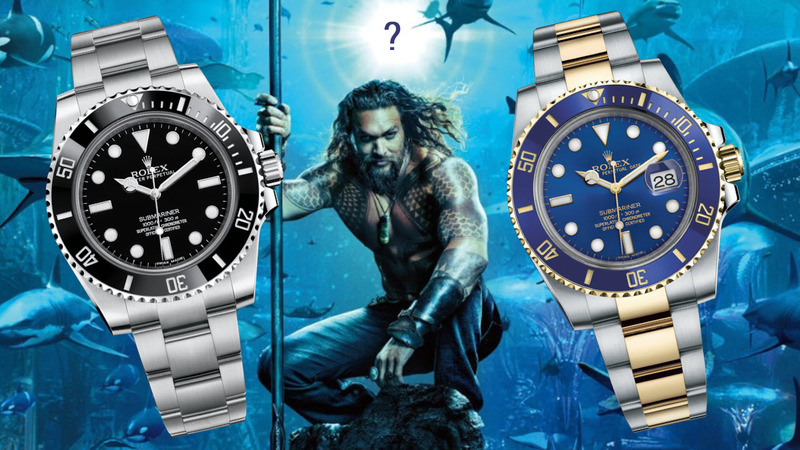 Yet, throughout the years, the Submariner has also become a symbol of luxury, associated with James Bond, as well as celebrity wearers like Steve McQueen and Al Pacino. 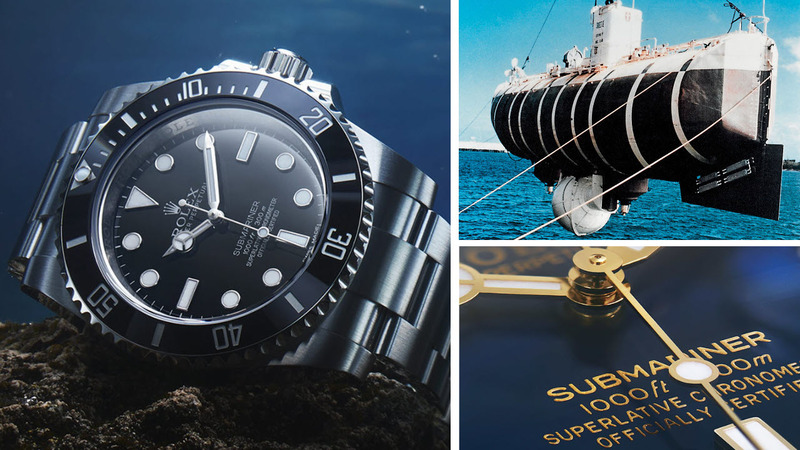 In this buying guide, we take a closer look at the various Submariner models available to buyers. In terms of function, the Rolex Submariner is primarily defined by its high level of water resistance, as well as the presence of a rotatable bezel. This bezel comes complete with minute markers, allowing professional divers to accurately measure the amount of time they have been immersed underwater. One of the key aspects of the Submariner’s bezel, when compared to other rotatable bezels, is that it only rotates anti-clockwise, rather than rotating both ways. This is significant, because it means accidental bezel movement can only make remaining dive times shorter, preventing divers from spending too much time under the surface. Since its introduction in 1963, the Rolex Daytona collection has achieved legendary status in the luxury watch field. Named after the Daytona International Speedway circuit in Florida, and designed to meet the needs of professional motor racing drivers, the watch is recognized as an iconic fashion accessory, largely thanks to actor Paul Newman, who wore his Daytona timepiece almost every day between 1972 and his death in 2008. With high levels of demand and limited production, the Daytona also has lengthy waiting lists, which have helped to add to its mystique. This has also made it popular among buyers on the grey market, as they are able to get hold of one much faster. This buying guide takes a closer look at the Daytona collection and the various options available. 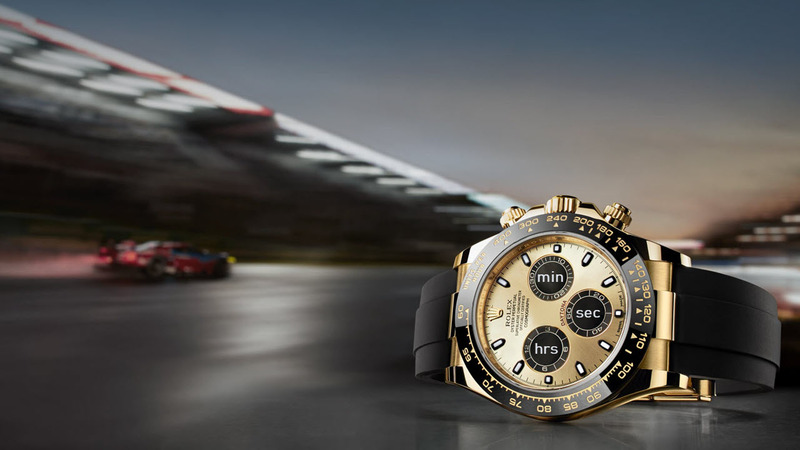 Rolex Daytona watches are equipped with a self-winding mechanical chronograph movement. This provides them with the ability to display the time and measure elapsed time, simultaneously functioning as a stopwatch and traditional watch. For this purpose the Rolex Cosmograph Daytona has 3 sub-dials at the 3, 6 and 9 o’clock position. The 6 o’clock position shows elapsed seconds, the 3 o’clock position shows up to 30 elapsed minutes, and the 9 o’clock subdial shows up to 12 elapsed hours. They are also certified chronometers by the COSC, guaranteeing their precision. In addition to this, the Daytona is famous for having a tachymeter scale on the bezel, which can be used to either measure speed based on travel time, or measure distance based on speed. However, it is worth noting that since the expansion of the collection, not all Daytona models actually have this tachymeter scale on them. As the name suggests, the Rolex Datejust 41 has a 41mm case diameter, and this makes it the largest model in the Datejust watch collection, with the other men’s models being 36mm. 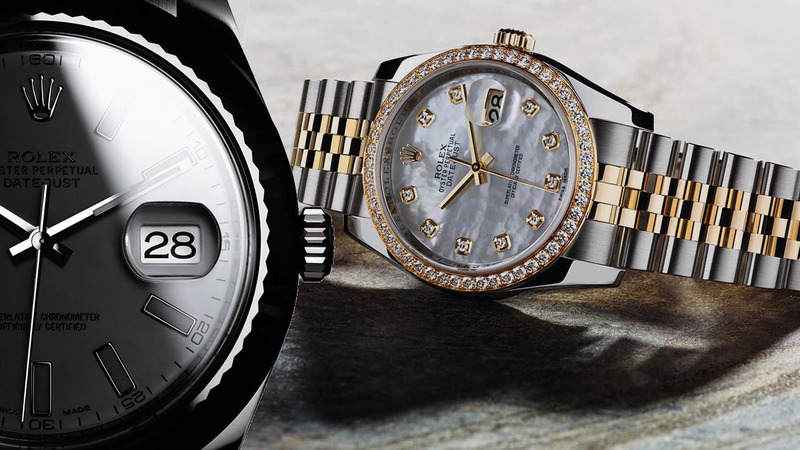 The Datejust 41 is also slightly bigger than many of the other popular Rolex sports watches, such as the 40mm Submariner and GMT-Master II. Unlike some other Rolex sports models, the Datejust 41 has many variations, which can make it difficult to find all of the colors, bezels and bracelet types in your local Rolex shop. It is, therefore, easier to order the model you desire at Jaztime.com, instead of wasting time, checking multiple authorized dealers to find what you are looking for. In this buying guide, we take a closer look at the different options available to customers. What Makes the Datejust Unique? 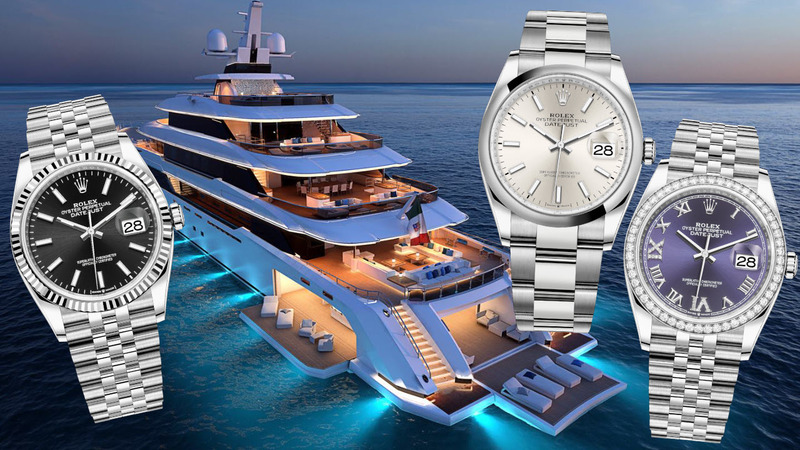 The Rolex Datejust is primarily defined by its date display window, which was not present on the original Rolex Oyster Perpetual collection, or similar models like the Explorer I. Indeed, the first Datejust model, released in 1945, is recognized as the world’s first wristwatch with an automatically changing date display function. In subsequent years, a further evolution of this concept was the Rolex Day-Date, also known as the ‘President’, which shows both the date and the day of the week. Yet, Day-Date watches are only produced from precious metals, making them more expensive than the Datejust models, and not everyone wants a day display on the dial. For these reasons, the Datejust remains one of the company’s flagship models and enjoys a great reputation among entry-level buyers and luxury watch aficionados alike. The Datejust 41 has emerged as an especially popular option since its introduction in 2016, thanks to the modern trend for larger timepieces. 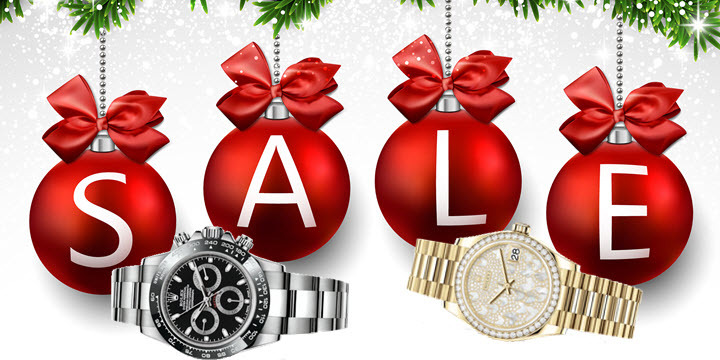 Nothing says ‘Merry Christmas’ like a Rolex watch. At Jaztime, we sell brand new Rolex timepieces at discounts of up to 20 percent, as well as certified authentic used Rolex watches at discounts of as much as 40 percent. Our extensive collection includes models for men and women, suiting various tastes and budgets. To make the selection easier, we have compiled a list of suggestions for both men’s and women’s timepieces, allowing you to buy the ultimate gift for that special someone in your life, or the perfect watch to treat yourself. Are you looking for a nice gift to give to the host of the Thanksgiving party you are attending? Perhaps you want to treat yourself to something special on Black Friday. Or maybe you are already thinking about some early Christmas shopping and would like to find a luxurious gift at a more affordable price. 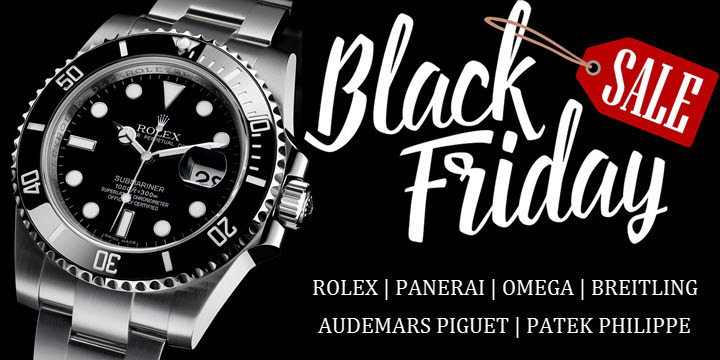 Here at Jaztime, we are celebrating Thanksgiving and Black Friday by reducing the prices of the Rolex watches in our ON SALE category. You can find out more about these holiday discounts below. © 2018 Copyright Jaztime Inc, All Rights Reserved.